In 2017 and in 2018 IPCC received grants of €28,500 and €12,000 respectively from the Heritage Council to carry out a variety of conservation and education projects at four of our reserves. Here is a short outline of each project. You can follow events taking place on each project from our Facebook page. Project 1: Enhancing breeding habitat for the rare marsh fritillary butterfly on Lullymore West Bog, Co. Kildare and preparing a conservation management plan for this site. In 2017 and 2018 donkeys are being used to graze a species rich grassland habitat on cutover bog so as to retain its suitability for breeding Marsh Fritillary Butterflies. In 2018 IPCC are developing a vision and actions for a Conservation Management Plan 2018-2025 for this site. We invite members of the public to give their opinion on the content of the plan by following this link. Lullymore West Bog is home to 23 Irish native butterflies. Of these the Marsh fritillary are rare within Europe. Their decline has been attributed to loss of habitat and inappropriate management of reserves for the butterfly. IPCC’s Lullymore West Bog habitat is in need of grazing management to ensure the breeding and feeding requirements of the butterfly are met. In June 2017 we finalised an agreement with a local farmer to introduce two donkeys onto the site. These animals graze the rank grasses and lower the height of the sward. They do not eat the food plant of the butterfly caterpillars which is Devil’s Bit Scabious which makes them an ideal management tool. The grazing regime in 2017 improved the habitat and we saw a 61% increase in Marsh Fritillary nests. The donkeys will return for the season in 2018. A training workshop was hosted during Heritage Week in August to pass on management skills learned in this project to other interested people. Coad Bog is a blanket bog habitat located on the famous Ring of Kerry. This site is the most distant from IPCC’s base of operations in Kildare. This project therefore aims to train local people – citizen scientists – to have them undertake routine monitoring work on the reserve such as water table measuring and butterfly monitoring during the year. In addition IPCC are consulting with our local community around the bog on the actions needed in a conservation management plan for the site. Already a public talk and training day have been held on the site in July and feedback has been obtained to include within the Management Plan. A further engagement weekend was undertaken on site during Heritage Week at an outdoor bog laboratory event to raise awareness about the management plan and to train more citizen scientists. 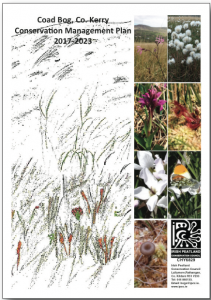 IPCC have completed the Conservation Management Plan for Coad Bog. 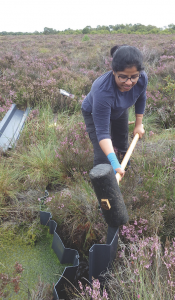 Project 3: Peat-forming habitat survey of Girley Bog Natural Heritage Area, Co. Meath and restoration of active peat formation on the cutover. Girley bog is a refuge for active raised bog habitat. Part of the site is forming peat and is actively growing. Raised bog habitat has almost been driven to extinction in Ireland due to centuries of turf cutting and drainage, industrial peat extraction and forestry. At Girley bog approximately 50% or 70ha of the site has been cut in the past. IPCC completed a field survey of this extensive area in June 2017 and have identified potential peat forming habitats that will help to protect active raised bog habitat nationally. Of course these potential habitats need active management and we are in consultation with the Government National Parks and Wildlife Service on a programme of management for the site. In August 30 people attended a safari event on Girley bog at which IPCC demonstrated the results of our work. 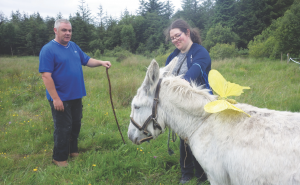 A further workshop was delivered in October with the local community and stakeholder group – Girley Bog Meitheal – to inform them of the results of the survey and onward actions planned. 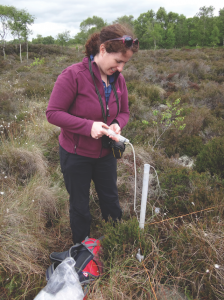 In 2018 IPCC are inoculating 64 square metres of the cutover bog with Sphagnum mosses to encourage peat formation once again in this area. IPCC welcome volunteers to participate in 4 work camps to achieve this project in 2018. If you wish to join email your contact details to bogs@ipcc.ie. Lodge Bog is a raised bog habitat located in the famous Bog of Allen. The site is a refuge for two iconic species of peatlands. These are Curlew and Large Heath Butterfly. Both of these species require wet bog habitat to complete their breeding cycles. In this project IPCC have blocked a significant drain on the bog with 21 dams which was having the effect of lowering the water table and shifting the wet bog vegetation to a drier heathy community. In 2018 IPCC are working with local farmers and technical bird experts to ensure the breeding success of Curlew on Lodge Bog. The project involves fencing, monitoring of the birds and farmland management. It was launched on World Curlew Day on April 21st 2018. Further public events are planned for Biodiversity and Heritage Weeks.